Earlier today I was asked to help troubleshoot an OpenText Enterprise Connect client issue in a pre-production quality assurance environment. It appears that testers were experiencing issues trying to open or edit documents stored in Content Server with the new desktop client. Today, the QA team was testing Enterprise Connect 10.5.2.178 with Content Server 10.5.0 and Enterprise Connect module 10.5.2. There was no problem accessing the test documents from the Content Server 10.5.0 web UI or via WebDAV. 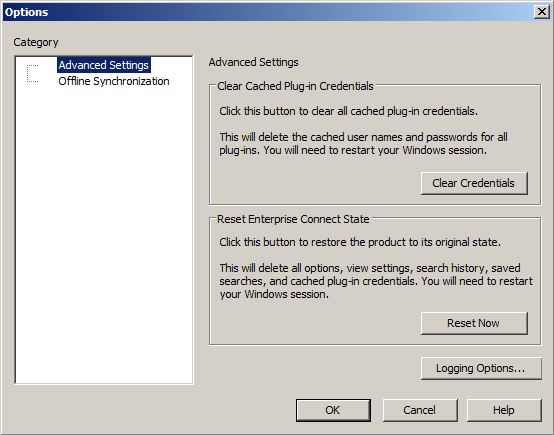 1.Right-clicking the Enterprise Connect desktop icon. 2. Choose "Options" from the pop-up contextual menu. 3. When the Options window appears, click the "Logging Options..." button. 4. On the Logging Options page, check "Log Enabled" and select "Error" from the "Apply to All" drop down menu. 5. Set the "File Location" field to which ever folder works best for you. 6. Click the "Apply" and "Exit" buttons. Close the Options window. 7. 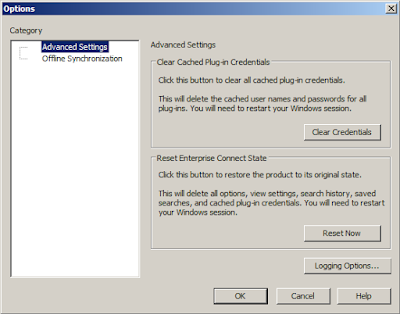 Logout of Windows and login in again to activate logging. At this point, I reproduced the error trying to view a document in Content Server using the Enterprise Connect client. 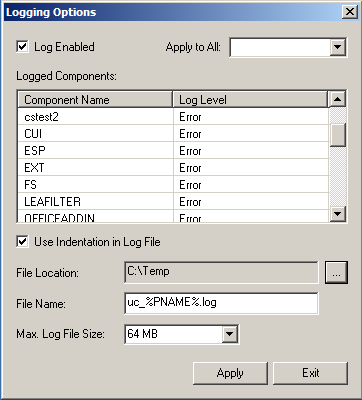 when the error was reproduced, go back into the logging options and disable logging. On my test machine, three logs were created: uc_explorer.log, uc_ucscore.log and uc_ucsync.log. Open the uc_ucscore.log file in your favorite text editor. I suggest Notepad++ over Notepad. 08:15:18.41 [UCSCORE ](4588): ERROR: Could not get service. 08:15:21.58 [UCSCORE ](4588): ERROR: Can't query Office Editor Documents: Could not find a part of the path 'C:\Users\[WindowsAccountName]\AppData\Roaming\OpenText\OTEdit\[CSInstanceName]\c2149\'. This error says that the Content Server webedit module can't do it's job. To verify the problem was with the Content Server instance and not the Enterprise Connect client installed on the PC, I added another URL connection string to Enterprise Connect for a disaster recovery instance and tested the ability to open documents. Enterprise Connect was able to open a copy of a test document that was in the DR instance just fine. So, the problem was at the QA Content Server. Taking a look at the installed modules, I quickly discovered that the OpenText Enterprise Connect, Email Services and Content Server Web Edit modules where all at version 10.5.0. The Enterprise Connect client being tested as 10.5.2. To finally resolve the issue, I backed up the OTHome directory (the path Content Server is installed into) and the SQL database and performed the upgrades to each of the modules to bring them up to version 10.5.2. Once that was complete, the QA test clients were able to open, edit and update documents without further trouble. It’s that special time of year once again where we have been shown all of the wonderful software enhancements that Apple is cooking up for us this fall. It is also the time when we, the brave nerds, install not quite fully finished software on our iDevices and Macs. All of this is done in the name of being nerdy. Actually, what I’m talking about is the pre-release public beta versions of Apple’s upcoming operating systems: iOS 9 and Mac OS X El Capitan 10.11. Both of these new operating systems are still under development so it’s not fair to judge either of them on their technical merits, stability or performance. The completed versions of both iOS 9 and El Capitan are due out "this fall." 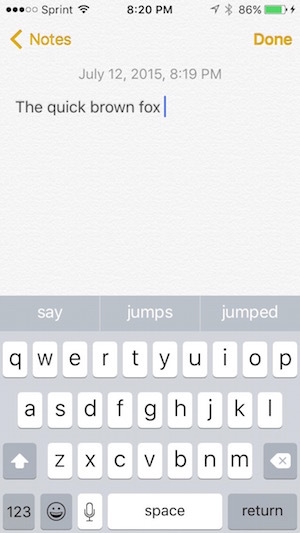 What I want to talk about here are some of the user facing enhancements in iOS 9. 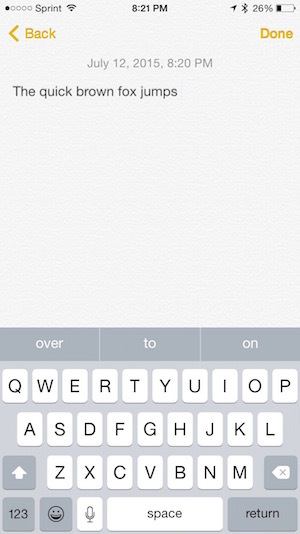 Last year, one of the big ticket items in iOS 8 was Apple allowing third-party keyboards to be installed on iOS. While having alternate keyboards available was fun, I dumped all of them inside a week. This year, I’m far more interested in the tweak Apple has baked into the iOS 9 public beta: changing keyboard key cap states. With iOS 8, I could never keep the Shift key state straight in my head: What was the CAPS mode icon state again? Solid white? Or was that grey? I can't remember. Better keep mashing the Shift key and retyping. At least half the time while I was banging out a long text in Messages, a tweet in Twitter or a long email in Mail, I would get the state wrong. So annoying! 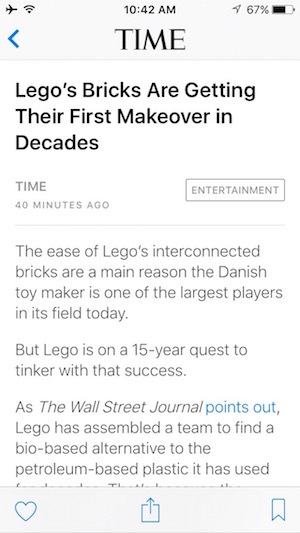 In iOS 9, now the key caps change state depending on whether or not Shift is engaged or not. Below is a sample of iOS 9 Public Beta 1 running on my iPhone 5S (left) and iOS 8.4 running on my iPhone 6 (right). I think I really like that enhancement. 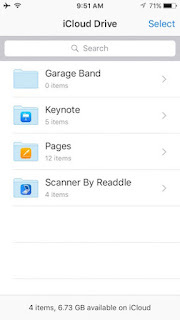 After installing iOS 9, you will get two new stock apps: News (as featured in the WWDC June 8 keynote) and iCloud Drive. News appears to be everything Apple showed in the keynote. 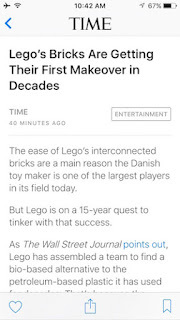 I was really excited about News when is was unveiled during the keynote address. As I said in my summary post on this year's WWDC keynote, I think this will be a worthwhile feature for both the iPhone and iPad. 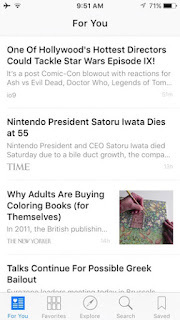 With Apple's focus on user privacy, I think this could become the go-to alternative for things like Facebook Instant Articles. 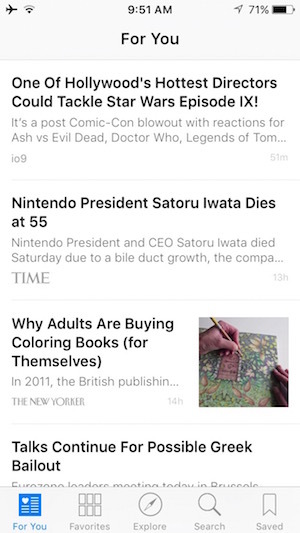 The beta apps has lots of great articles from across the spectrum of publishers and topics. I think the biggest challenge users will face is taking the time to fine tune their news feeds. 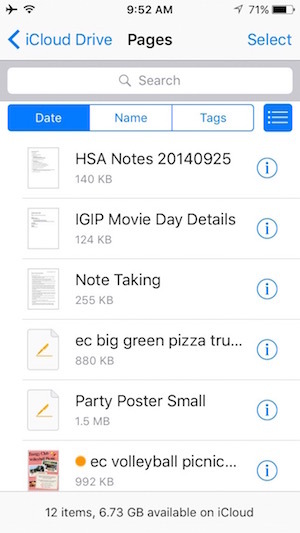 iCloud Drive, in my opinion, is a new iOS client app to help round out the features of iCloud document storage that launched as part of iOS 8 and OS X Yosemite last year. With iCloud Drive, you now have access to the folders and documents that you have stored in iCloud. iCloud Drive works similarly to Microsoft's OneDrive or Google's Drive iOS apps. On the left, you can see the top level folder view for iCloud Drive. 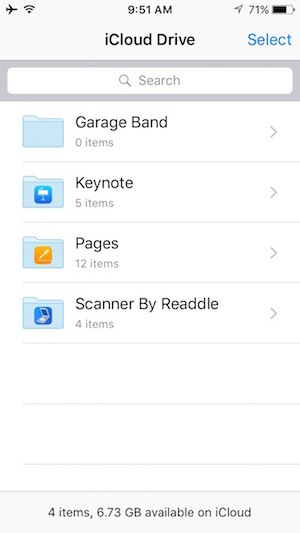 On the right, you see the list view of the contents of the Keynote folder. It's pretty basic stuff to be sure, but is also a utilitarian feature that Apple needs to gain parity with Google and Microsoft. iOS 9 will be released later this year and is expected to run on any iOS device that is already running iOS 8. For more information about iOS 9, check out Apple's iOS 9 preview website.